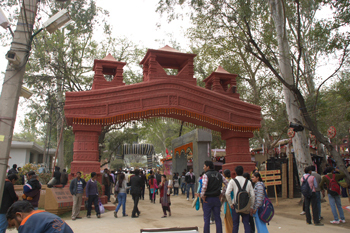 The biggest handicraft mela ( exhibition ) of the country held every year at Surajkund during Feb 1st to 15th Feb every year. This mela attracts tourist from all over the world as almost all the states of India participate in this event. Many foreign countries also participate in this event including SARC countries. Other than SARC counties Afganistan, Thailand, Tajikistan, Uzbekistan, Kyrgystan, Congo and more Asian countries also participate in this biggest annual craft and cultural event. This mela provides excellent opportunity to local crafts man of various states and countries to exhibit their skill and art. This handicrafts exhibition is organized at SurajKund near Faridabad of Haryana state. This place is close to Delhi at a distance of 8 KM from South Delhi. Well connected road and public transports are available to reach the exhibition ground. Mela is organized in open ground with trees around. As this mela is organized in month of Feb so excellent day time climate of winter helps the tourist to move around this open mela ground. Every year one state is highlighted and given the status of them state. In year 2012 Assam state was chosen for this. Assam pavilion displaying various tourism places, handicrafts, traditional Assam food was served during exhibition. For the year 2013 Karnataka is chosen for them state. Elaborate security arrangements is done during the mela period and several check-post with security checks done to prevent any incident. Local school students come in groups as special tour is organized by school authority. Special discount is available for students. There is food curt serving almost all types of Indian traditional dishes. Toilet facilities are available in mela ground. Giant wheel, games, Amusement parks are established at one side of the mela ground. Entry fee is Rs 50/- per person. Children below 5 years are exempted. Daily evening at 6 PM cultural programs organized at Natyasala . Everyday a different group or from different state including foreign participant countries participate in evening program. Fashion show on Khadi is also included in program schedule. Delhi is well connected by road, air and rail network from any part of India and from foreign countries. These special buses are available from 8.30 AM ( at ISBT Kashmeere gate bus stand ) till 5.30 PM in every half an hour gap. The journey time from ISBT to SurajKund is 1 hour 15 minutes in peak hours. Starting from ISBT these buses have stops at Rajghat, ITO, SaraiKale Khan, Ashram, Badarpur and last stop is at Suraj Kund Mela ground. Special buses are also available from Gurgaon, Faridabad and Shivaji Stadium to the Mela ground at SurajKund. 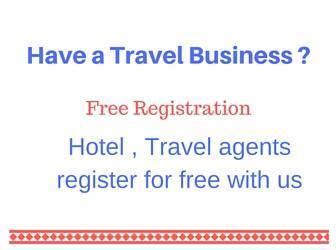 Nearest Railway stations are Delhi, Gurgaon & Faridabad. From these places by road you can reach Mela ground. There are hotels available at SurajKund for staying however because of its proximity to Delhi tourist prefer to stay at Delhi and visit SurajKund in day time. Delhi airport is the nearest airport.